Strange. My first run on the new watch was okay, but the last two are labelled as treadmill runs and there's no map. Also forgot to say that if PMJ is at his parents' this weekend he will be happy as there appears to be a large beer tent within shouting distance. nice 16 and decent mileage, oo. Badbark, nice 10k and mileage. thanks for the suggestion on the mlr. I'll try and implement that. enjoy the taper. Gul, nice start to the week. 20 for me this morning. Felt very strong and comfortable in good conditions coming in at 7.42mm. I don't normally run them that fast but hr was in a good place and I quite enjoyed moving a bit faster. That's 4 x 20 and 1 x 21. That's as many as I did in total for London. Should get 2 more in over September. I can now have the pizza and beers I was planning last night. bit of a mini taper this week with a half Sunday. Though it looks like i should hit 200 miles for August which would be 40 miles further than last August and pretty decent given a 12 day holiday. Good session, DT. Nice to just go with the flow sometimes. Got to run every day this week as unable to run at the weekend due to a trip to Bruges. That will make 7 days in a row, so recovery runs will be in evidence to prep for the next quality session. Did 10 miles today. Ran it as an alternate miles session, 5 x 7.0x pace and 5 x 6.4x pace. Average came out at 6.53 pace. A good session and well managed on tired legs. Trail recoveries tomorrow. You're on great form DT19 and deserve the mini taper. I'm resting today ahead of a 10k tomorrow evening. Also planning to move this weeks long run to Thursday for max recovery ahead of GNR. Any particular reason why you don't have a smartphone Gul? It makes life a lot easier uploading runs and viewing Garmin/Strava data without having to fire up your computer. no smartphone here, either - never felt the need - I make calls and texts on a cheap Nokia - never occurred to me to "upload" runs or use Strava and suchlike . just record miles, with a note here and there, in small pocket diaries. DT19 - solid 20 miler and set for good miles this month. GD - that's a great session, even more impressive on tired legs. OO - good luck with the 10k this evening. I presume GNR is on 9th Sep? Never bothered with a smartphone. My previous watch wouldn't upload without a smartphone, so I just used to note down the stats by hand, but obviously it was quite limited. As you say, much easier with a smartphone than a laptop, say, so might finallly succumb. 7 easy miles this morning. Retired a pair of shoes yesterday. They had holes in the uppers and near the back of the sole, the rubber over the toes was coming off and the outer edge of the soles were very worn (supination?)! They passed 1,000 miles during their last outing and at £20, that makes 2p a mile, so can't grumble Tried out one of the even cheaper pairs from Lidl this morning. ps - Strava - my club's website has a rolling update on its front page of members' Strava data - so, for example, I know that someone has done a 0.5 mile run to Tesco - why tell the world ??? !!! x-post Birch - my current phone doesn't even have a camera I am worried I might become anti-social if I get a phone with internet access. Talking of phones (and Tesco) my new private phone (since retirement) is from that supermarket. I know you like a bargain Gul so I'm paying a tenner a month for basic smartphone which seems fair. Enjoyed the rest yesterday and looking forward to a 10k blast this evening. Its a flatish course with an offroad section- will be aiming around 37 mins. I'm on Tesco, have been for years. I pay about 15 for a decent phone and very decent data package and it's all on o2 network for great coverage. I can't comprehend that mileage in cheap shoes. I replaced mine last week and my knees and body in general feel so much better for the protection of new ones. Lots to catch up on here! G-Dawg - Good 20 bagged and a decent session. I like the sound of that one, may have to give it a try. DT - Sub 82 seems ambitious but the way things are going it could be a possibility. Is it Kenilworth half you are doing this weekend? Hope your son enjoyed the football! That's a rapid 20! Congrats on the rapid parkruns OO & Badbark. Got soaked on my 16 miler Sunday morning and for the first time in months was cold on a run! Did record my lowest ever HR for a run though (138) similar on yesterdays 9 at 7.53mm. I do take this with a pinch of salt though as its wrist based. I looked at Kenilworth as I've done it 3 times before and it's a great event however it's a new course this year and didn't want to chance the unknown. I've opted for Wolverhampton which I did last year. I've turned my optical hr off and continue to use my chest strap. I was trying to use my chest strap for sessions & tempos to get a more accurate reading, however I was getting some pretty bad chafing from it in the heat so had to abandon it. I will try it again when its cooler but I need to see if a newer one is more comfortable. Just put some Vaseline or other anti chaf cream under the bottom edges of the strapwhere you were chaffing. Will be fine then. 7 today at recovery. one more bigger effort tomorrow and a fairly big 10 days will be done and I can have a few easy days taper. Gul - Do you really run in shoes so worn? I stop running in mine as soon as I see wear on the middle of the soles as that's usually where mine tend to go. I use them for walking to work when they show signs of wear. Bsck to it this week. 5 miles yesterday on an undulating route at 6:44 pace and 11.3 today on a hilly route 7:12 avg. Sunny and warm today and felt good. Stevie - another v.encouraging session with the low HR 16, to follow the 10 mile tempo the other day. 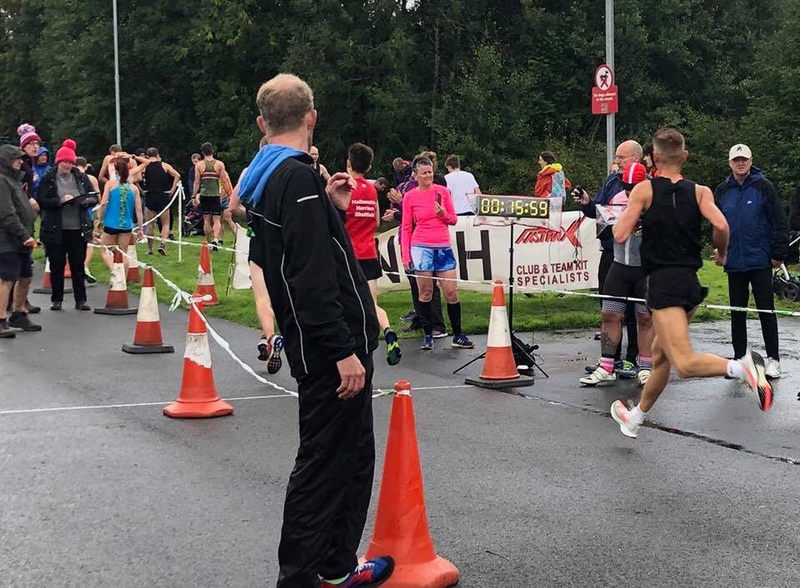 Mixed feelings for my son (thanks for asking) - he secured a PB with 16:00 official time, but was slightly miffed, as he thought he'd sneaked under - and this pic suggests he may have a point - he's in the red top, a stride beyond the line, with clock showing 15:59.
hope OO has had (or is having) another good one . . . . Retired a pair of shoes yesterday. They had holes in the uppers and near the back of the sole, the rubber over the toes was coming off and the outer edge of the soles were very worn (supination?)! They passed 1,000 miles during their last outing and at £20, that makes 2p a mile, so can't grumble Tried out one of the even cheaper pairs from Lidl this morning. Brilliant, well done on the cheap miles! I've a long way to go in my Hokas to match that. I paid £70 and have run 2330 miles so far, so about 3p a mile. So I'm going to have to reach 3,500 to match you. birch, that seems very unlucky!! though isn't it right that a race time is always rounded up? so if you get 15.59.33 say it always goes down as 16.00? I think you're right, DT. Steady felt good tonight. 6 miles on the trails and pretty much ran on feel but made sure I didn't push hard. 7.09 pace average with avg HR at 1.36 maxing at 150. Seems low enough and helped by temp being only 20 degrees and flattish course. Four consecutive runs into a 7 day streak. Gotta run smart. 36:31 at the 10k tonight. It's my fastest for a few years and finished in the top 10 for the race. I felt great for the first few miles and peaked with a 5:41 in mile 4. The wheels came off a bit after that but managed to hang on for a 6 Min last mile. Birch: Wow those Nike Pegasus Turbo look sweet! 0054: Great time for 10km. You are on track to run sub 36 mins for 10km! G-Dawg: Good pace for a relatively low avg. HR. Amazing 10k, OO. Well done Sir, proper impressed here. OO - that's a brilliant 10k; you must be really chuffed. Great work! DT19 - I must just be very lucky that my knees don't seem to need too much protection. Stevie - I've just switched to a wrist HRM. Used to get all sorts of spurious readings with my chest strap HRM - well, at least I hope they were spurious. GD - nicely controlled run. Mrs GD came down with a cold at the weekend, and I now have a slight temperature. New watch is showing a slightly elevated resting heart rate. Not too surprised then when 11 miles this morning @ 6:52 m/m was fairly hard going. Hopefully will shake it off fairly promptly. OO – Awesome 10k time! 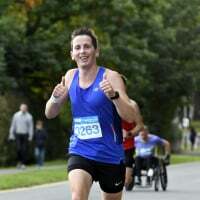 I ran the EAMS Carrickfergus Castle marathon today as my final long run before Berlin. I wanted to dip my feet into the hurt pool without getting submerged. So I ran a controlled MP + 30 seconds throughout with a few at MP near the end. I know it’s more than anyone would advise but I think I know my body best. I finished in 2:57:29 and took the win but with a very small field. My average HR was only 139 which is my lowest ever for a sub 3. That’s my 70th Marathon (or ultra) completed. So it’s now taper time with no more runs further than HM distance planned. I’m feeling great and confident for Berlin. Excited too! Gul - 11 well bagged when a bit below par . . .
Badbark - nicely done. nothing silly now . . . . Happy birthday Birch. Hope you have a good one. So unlucky for your son not to break 16 but still a brilliant time. I'm sure he'll crack it soon. The rounding up is harsh, maybe if it was 15:59:50. I mean if you run 2:59:59 for a marathon on your chip tine it's sub 3? I'm confused as to how it works across the distances. OO - Brilliant racing again. I bet you are delighted with that. NYC could be a good one for you this year. Badbark - That HR is very low for such a quick marathon. Are you aiming for sub 2:45 in Berlin. Must be a possibility given your current fitness and form. Gul - Lol! Very good run when not feeling 100%. I hope it's nothing with a lasting effect. G-Dawg - Strong running there. Heading out in a bit for an easy hour. Happy birthday Birch! Hope you have a good one, good reps! Congrats on another marathon win Badbark, looking great for Berlin. Session tonight was 2mile, 1mile at 10k/5k pace X 2. 90secs between reps and 3 mins between the sets. Legs were tired in the warm up and really wasn't feeling it. Managed to do 12.15/5.57, 12.17/5.54. Found it really tough and had to dig in for the 2nd set, pleased to get it done though! Birch congrats you are still in fine form. Badbark very solid run and looking good for Berlin. Excited for you. First time in ages I swam a mile today and 2 miles recovery run. Long one planned in the morning.